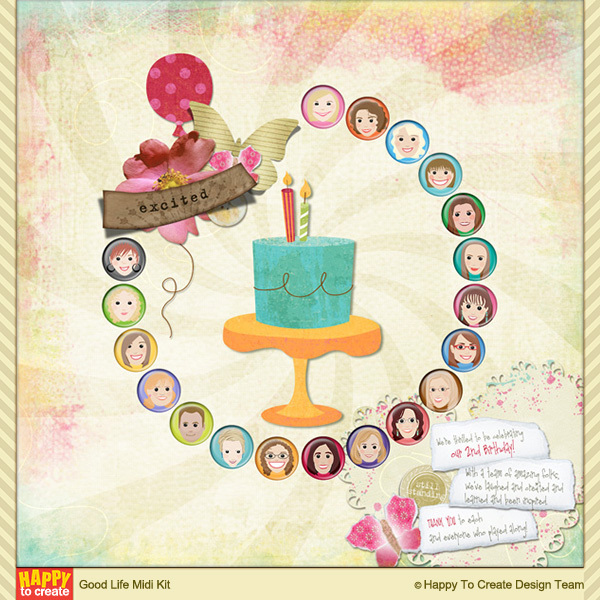 Two years ago today, Happy to Create was born. 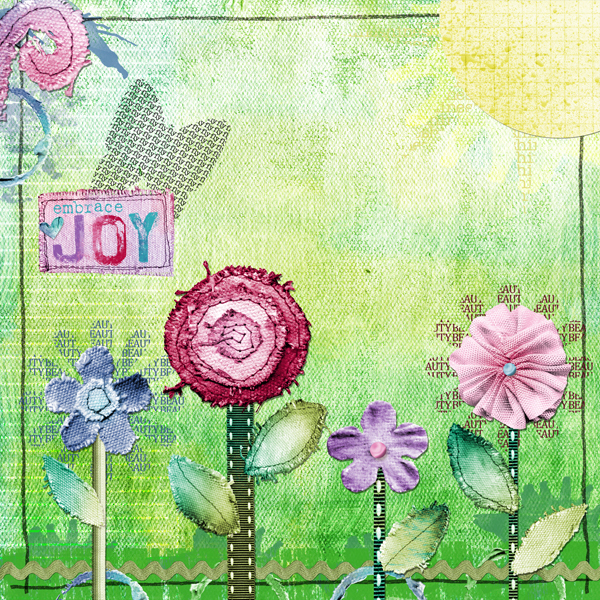 A group of crazy crafty creative digital scrapbooking designers wanted to make a place on the web that celebrated all sorts of fun crafty goodness. So, they made it! They believe that there is room for all sorts of creative endeavors and all sorts of creative people. They even scrapbook on their phones! Crazy right?! Last year around this time, I was asked to join their team and I am so glad that I did! I have learned so much from them and hopefully they have gained some inspiration from me as well. If you are not familiar with digital scrapbooking, the concept is of course the same as traditional scrapbooking, except without the mess. (Sometimes the mess is nice though!) It was a perfect solution for me with young children around to keep scrapbooking memories without worrying about expensive papers or little fingers getting cut on sharp scissors. Digital files are kept on your computer and then manipulated in a program such as Photoshop Elements. Elements works on the concept of layers and to me that’s where the fun comes in. You open up all the things you would use on your traditional page… paper, photo, sticker, wordart… and then drag them onto your page (up from the bin on the bottom.) You can move them around and make them bigger or smaller and can even recolor them. The program has brushes and text… and so many cool things that it is easy to lose a day just playing. Trust me, my laundry pile knows! When you are done, you print your page to keep in an album or you can have it printed in a collection in a book. OR you can even have your creation printed on canvas… the possibilities are endless. It is funny how it has all come full circle for me… a path that I set out on, not knowing how I could actually get to where I thought I wanted to go. But I did it. Did what you ask? I created a mixed media painting with all elements that I created. 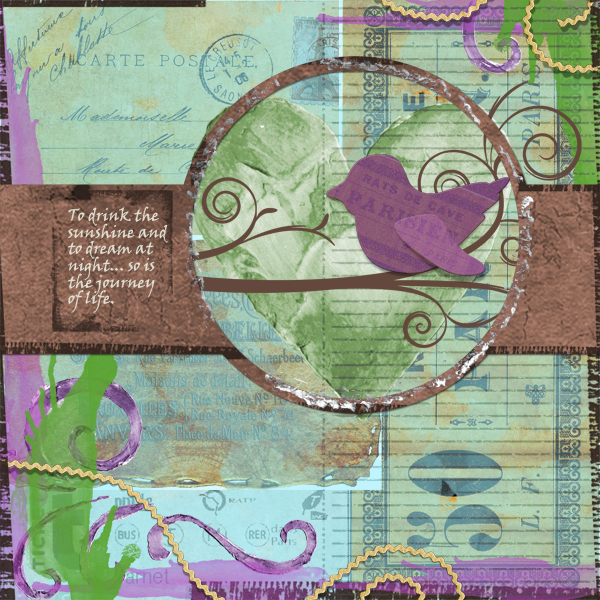 Now, this may not seem like quite a feat, but with paper collage, people have a tendency to use scrapbooking papers and found items for their elements and backgrounds. Well… I made all of the papers I used :). I have to say, I was pretty excited. And the more that I think about making things my own, the more my brain starts to think of ALL the media I have at my disposal, including my trusty rusty computer. 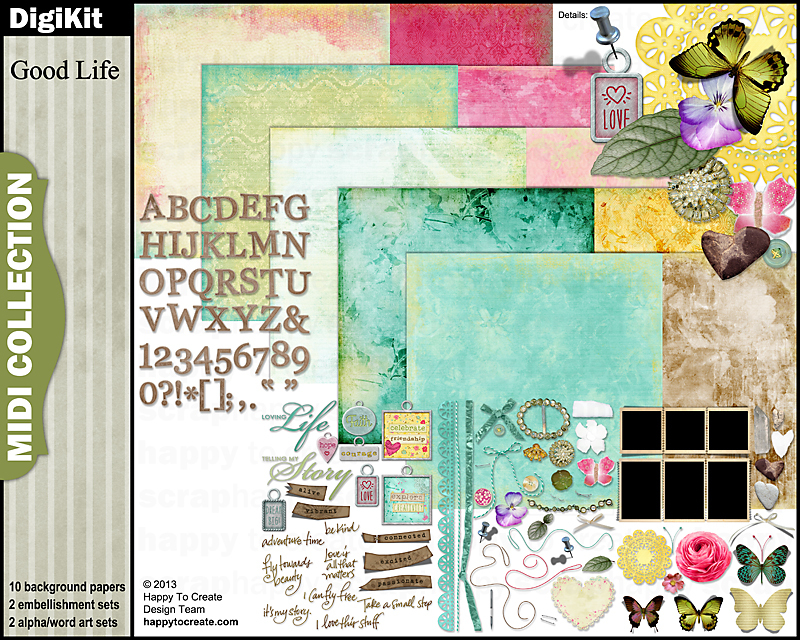 One of the reasons I mention all of this is that starting today, you can grab an entire collection of digital scrapbooking goodies from Happy to Create for free (along with a regular bunch of freebies if you sign up for the newsletter.) These are high resolution graphics for you to play with on your own (not for commercial use… they are free after all… and wait till you see them!) The shop of course has a full range of things to look over (including commercial use products) but free is always good to start. Photoshop Elements has a free trial for 30 days as well so why not dive in! I have found so many different ways to create… both digitally and with the real stuff… and it is fun to continually try to push the limits of both. I hope you have fun creating today! I’m glad you like my tags. They are so much fun to make! I’m working on the May one right now. I’ll post it in a few days or sooner. Thanks for stopping by my blog. The piece on this post is all digital! Cool right?! Thanks for the comment! Looking forward to your piece!